Believe me, school has never been this good to me! Yes, I went to a school, but I am not going to school *Phew! * It was great, I won a coveted seat at the final exam tasting of the 3rd semester culinary students of the culinary division of Nashville Tech. I got to take some of the the students' final exams, and I had no stress for taking the exams. It was a piece of cake for me. Seriously it was my pleasure to partake in the offerings on this evening. As I got there, there was a table set up in a meeting/classroom with a lovely chocolate center piece. The chocolate sleigh had an intricate design drawn with chocolate on the site. 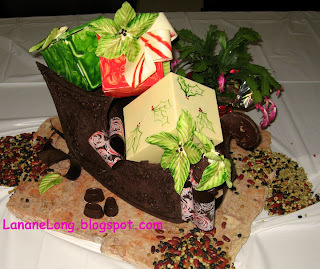 It was filled with painted white chocolate boxes adorned with white chocolate poinsettia leaves, and white chocolate ribbons. The center piece was an exercise from the dessert class, and place on the table for our visual pleasure. If you look closely at this edible centerpiece, you may see that someone has already broken off the front of the sleigh as a taste test. There were other non-cooking classes, final projects, and exams going on during this culinary final exam, and there were a few students mulling around sniffing and wondering what smelled so good. Think back (or for some, think now) to your starving school years. For my college years, when any adult would come visit, and offer a free meal, it was like winning the lottery for me. To be a student at Nashville Tech while working hard and having to smell the delicious food must have been really tough. I don't think that I could go back to school, it is way too hard for me. The only way I can go back is to do is the way I did it this night, and that is to taste tasty treats. 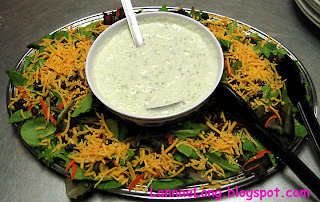 To start, there was a simple salad of greens, black beans, cheese and a yogurt dressing. The dressing was fantastic. It was low fat yogurt, cilantro, lemon, lime and a dash of honey. I can make that. There was just enough citrus, and a lot of cilantro, which I like. I love cilantro in many things, like this dressing, or even simply steamed over fish. I heard that there are some people who have a gene that makes them perceive the cilantro flavor as floral soap instead of a fresh aromatic herb. I am thankfully not one of the soap people. One of the main courses, cooked by Brandon from N.O.L.A, was a meatloaf and potato dish. 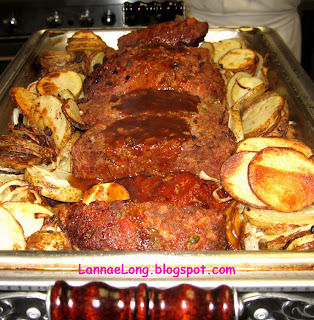 The meatloaf had no egg in it, to my surprise, as it was flavorful, moist, tender without it. I asked Brandon what his ingredient list was, and it included two cuts of beef, one with more fat than the other, and two types of sausage. One sausage he said was regular breakfast sausage, can you believe that? He confirmed there was no garlic, but he considered it, then thought there were so many other ingredients in it, that garlic would just be too confusing. The other flavorings and other sausage made this meatloaf quite flavorful all the way through, and garlic was not necessary. The sauce involved with this dish was a meaty tangy sauce. I asked him what went in it, and of course it is beef roast drippings and veal stock reduction. OK, the last time I attempted a veal stock reduction was... oh, yes that was never, and the last time I made a roast with enough pan drippings was years ago. There is no hope to make this at home. So, I pressed Brandon to find out where he works when he is not at school, so I could get some more of this sauce and meatloaf. Sadly, I don't think that I can unless I buy a catered affair to fill a function room. Hmmm, $30/head, 100 people, tax, tip, room rental, bar rental, staff wages ... ok, maybe that is a bit excessive to get more really great meatloaf. The next main dish was made by Fran, and was inspired by Northern California. 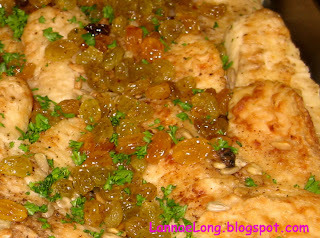 It was a tilapia with a butter, white wine, and raisin sauce over a rice pilaf. The pilaf had garlic, onion, chicken stock, and white wine in it. I learned something today. I asked what made a pilaf a pilaf instead of just another rice dish. Pilaf is a process, like risotto is a process. Pilaf involves stove top toasting the rice in oil with onion and garlic, then flaming with white wine, then adding the chicken stock to cook the rice like normal. This rice was quite yummy with the fish on top of it, and the fish sauce and raisins that dripped down into it. The raisins were not too sweet, and the rice flavor was not too strong, so the combination of slightly sweet and slightly savory were a perfect match. The pilaf was a nice representation of what a real pilaf tastes like. I am guilty of making the prepackaged "pilaf" brands from Near East, Zataran, and Rice-a-Roni. All of them have the same manufactured flavor (made in New Jersey at the flavor center) that is what has become associated with pilaf. That boxed flavor has some glutamate molecules in it to make it addicting, the aroma is completely manufactured to be garlicky (but is not at all what fresh garlic smells like), and those flavor and aroma attributes do not occur in nature. It was my pleasure to taste what a real pilaf tastes like, it is definitely more delicate and subtle than those boxed ones, and it felt good to eat real ingredients that do occur in nature. The veggie side made by Fran was also inspired by Northern California. She made simple fresh veggies with roasted garlic and white wine. The method for this volume of veggies she made was to sautee the veggies on the stove top, and then put them onto a baking pan and put them in a low oven until we were ready to be served. They were good, and perfectly done. 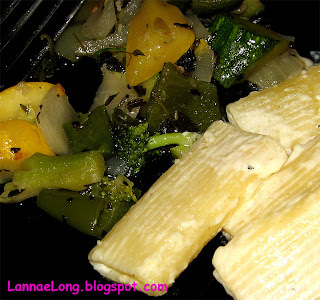 The veggies were cooked, but not soggy or floppy, and still were just al dente, the way I like them. I think the time in the oven helped the veggies become the way I like them. I pressed Fran for how she made this dish because I have problems with my stove top veggies, sometimes they burn, sometimes they are not cooked all the way, sometimes I drown them in wine or water. There was even one occasion that I made sauteed green beans that were burnt on the outside and some were completely uncook on the inside. I know, burnt and raw at the same time, how? For whatever it is worth, it never occurred to me that I could move stir fried or sauteed veggies into an oven to finish the cooking. Next time I make veggies like this, I will start them on the stove top, and then put them in the oven on low while I cook my other dishes. As a sweet ending, Tracy made a bread pudding for us. The bread pudding possibly had some fat and sugar grams in it with a quart of cream, over a dozen eggs, a couple cups of sugar and choco chips. It was was a Sweet Home Alabama recipe from Tracy's Mama. Tracy's Mama is from a small little town in Alabama, and when Tracy was a kid, the only place to eat was at Tracy's Mama's home cooking restaurant. Tracy's Mama is one of those Southern women who just seemed to be born with the country soul to make Southern comfort foods. 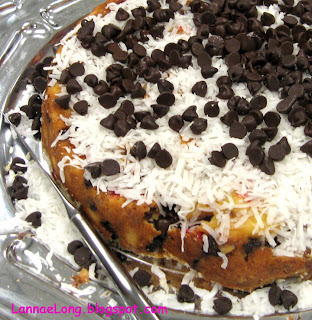 Tracy learned this sweet dessert from her Mama at an early age, and carried on with it today. This whole trip back to school was exciting and yummy. I will be vying for a seat next year and partake again. It was the best final exam I ever had. So, in the meantime, all I have left are my memories of this meal, and to look forward to cooking demonstrations from the Nashville Tech Culinary Division on TV! Yuppers, I was told that on Nashville Public Access TV, they will be showing Spring Semester cooking classes. I got Tracy's email, and I am gonna keep emailing her to find out when the cooking classes are coming up for me to watch. Ya know, FoodTV has moved away from cooking classes like Juila and Kerr, and moved to more fluff shows. I miss those cooking shows, and I don't watch any FoodTV anymore. Now, I can get my fix of cooking shows right here in Nashville. Well, I'll be! 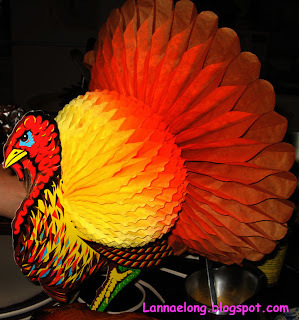 Yeah, this is one of the best Tgivings I have ever had. It was a small gathering of just 3 sets of neighbors. It was quiet and relaxing. We sat back with the 3 dogs and 3 cats. We rose a glass to cheers and here here. It was so nice, time got away from us, and before we knew it, it was nearly midnight. I am thankful for such wonderful neighbors, and such a lovely evening. Back when we first moved on this street, there were a bunch of neighbors who would do a "pick-up" potluck dinner on Sunday night, as a way to clean out the fridge, and hangout as stress relief before the work week started again. The dogs would run around looking for treats, the grill would be cooking something tasty, and we sit outside hoping that these community dinners would continue on. 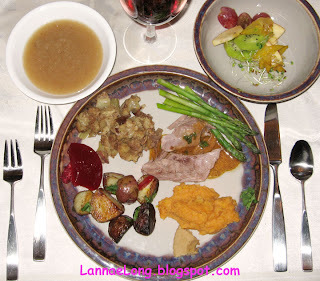 As time goes by, and life circumstances happen, we all had to abandon the potluck dinners. We missed some of the neighbors who have moved away or who have passed on, but the few of us held tight on this Thanksgiving evening. It was like being back in the good old days, and I just soaked it all in. choco reddi wip, uh what do I say about this product? It was last Friday, it was 1 pm, and I was plugging away at work. I was getting into a funk, and decided I really needed lunch, and I was going to treat myself to a really nice lunch. But where? So, I got up, and started walking towards downtown. I thought to myself, great dining is a full body experience, and it includes great surroundings, great traditions, and great service on top of great food. It is possible to have such great food and traditions, that surroundings and service are secondary, and sometimes inconsequential. I mean, most excellent Chinese restaurants in NYC are hole in the walls, would not want to use the bathroom, no atmosphere kind of places, but the food just blows you out of the water, and you go back for more. Is it possible to have mediocre food and service, and want to go back because of the great surroundings and traditions? It may be a rarity at best, but I think I found a place in Nashville with average food, but the surroundings and traditions just beckon me to come again. On Friday, I found myself walking into the Schermerhorn Symphony Center, and I heard there was a little Symphony Cafe in the building. 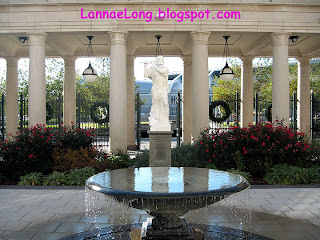 On my approach to the front of the building, I notices really nice architecture in a European, old world style, and a really nice fountain. For a moment, I was transported to France in my mind, hoping for a great baguette sandwich made with air dried cured meats and a soft cheese. My anticipation grew. I walked into the door, and asked the ticket desk folks where the cafe was. They pointed me down a marble lined hallway that led to the main atrium lobby. The hallway was lovely, and it was just an access hallway from the ticket desk. The hallway had giant windows facing the courtyard, so bright light streamed in to the space which reminded me walking through a French castle, like Fountainebleau, with a grand ballroom with a wall of large door/windows that overlook the gardens out back. On the inside wall of the hallway were photos, framed art and framed posters that were perfectly picked to provide a real privileged and cultured feel. I was kind of pinching myself because I am just a working stiff looking for lunch, yet I felt like I was transported to the lap of luxury, wealth and privilege. So, I found the little Cafe counter. 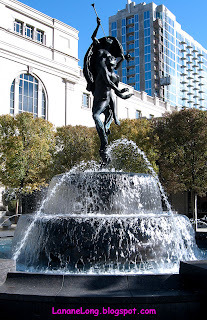 It run by a food service group out of Texas, and is owned by the Nashville Symphony. 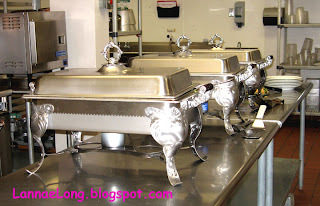 The food, well, it is suspiciously like pre-made food distributor food that gets served at large convention centers or at the generic food counters at the airport. The offerings are tuna, turkey, cheese or ham sandwiches, and salads including fruit, chicken, macaroni and potato salad. Coffee offered is from Seattle's Best Coffee company. I opted for a 3 salad combo, and I got macaroni, chicken and fruit on a handful of bagged iceburg lettuce mix. Ok, I was underwhelmed with the food, but I just needed the calories at this point. What I decided about this meal was that it wasn't going to be about the food, it was going to be about the surroundings and traditions. 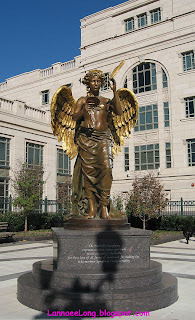 I took my plastic plate out to the courtyard, and enjoyed the fountain, the statues, and the sunshine. No one was sitting in the courtyard but me. I took in the beautiful building named after our late great Nashville Symphony Music Director Maestro Kenneth Schermerhorn. The building was obviously designed with care to honor the memory of Kenneth Schermerhorn, and I really felt that sitting there. 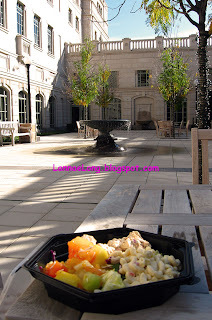 The building and surroundings suspended me in another place for just the few moments I sat in the courtyard with my plate. That place was a romantic, quiet, beautiful place with fragrant flowers and fruit, and cordial people who are living in the present and appreciating the beauty around them. When it was time for me to go, I picked up may plate of food, and walked out of the courtyard through the open gate, and onto 4th Ave So. I felt like Chance Gardener, as he took his first steps out of the Old Man's house onto the mean streets of Washington D.C. After each step I took further away from the beautiful Schermerhorn Symphony Center, the rude awaking of reality grew. I will be Bach Schermerhorn Symphony Center, so you can take me away to that lovely place, be it only a few minutes at a time. Well, the Burghs visit had to come to an end at some point. Our last supper together was a nice dinner out. We went to Margot Cafe. We were all there, old friends and new friends together to break bread and talk about what is new and what is old. I was so psyched because I got to dine with 4 old friends and 3 new friends, and everyone seemed to get along so well. We got lucky, we got to sit at our table upstairs where it was warmer, as the downstairs is a bit drafty. It is an old building with no insulation, and it seemed that during the Burgh's visit, they brought down some of that Pennsylvania winter wind and chill with them. Let me tell you what I got to eat. I started with the handmade potato chips, as always, with and extra aoli to dip my chips in. This bowl of chips is big enough for a lot of people, but if I had my way, I would eat an entire bowl by myself. My second dish was a monk fish chowder made with cream, thyme, big chunks of potatoes and monk fish. It tasted great, and it was really filling. There was no reason why I needed to go further with my meal, but I did. It seems like braised pork belly is all the rage in every restaurant in Nashville, so I ordered the pork belly with beans and greens. It is so funny how pork belly is the new prime rib. 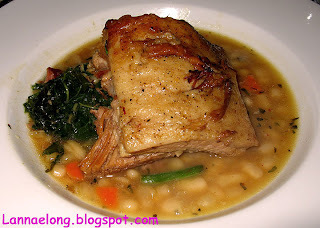 For so many years, I have not been able to find one pork belly on any menu, except for really authentic Chinese restaurants where it was made into a clay pot stew with lotus root. Since there is not one truly authentic Chinese restaurant in Nashville, I had not seen pork belly on any menu until now. The question I have is, where did all the pork bellies go in years gone by, and where are all the pork bellies coming from now? All I know is that I cannot get one cut of pork belly from my pork supplier because they are too busy selling the pork bellies to the restaurants. Isn't there an old joke about pork belly commodities? One reason why I wanted to post about this Margot Cafe dinner is not about the food, rather, it is about the wine. I brought the wine instead of us buying bottles at 100%+ mark up on the Margot menu. I brought Buehler Zinfandel 2006, made from 36 year old grape vines. Back in 2005, as we toured the Buehler Vineyard, the Wine Spectator rated the Buehler Zin as the #1 Best Value of the Year. The only problem is that there was only 1200 cases out there, and and Royal Caribbean bought out a ton of those cases, and when the Wine Spectator hit the streets, the lucky few flocked to their wine shop and bought the rest. There was not one bottle left at the vineyard, and we were unable to try or buy this treat. Buehler grows these grapes in a true European old world way. He puts stumps or poles next to the vine. He does not tie them, he just lets the vines be free form around the stumps and poles. The yield is less than with tie method, but it makes for happier grapes and a plant that devotes its growing power to fewer grapes, and makes a fuller wine. For this family, it is not about making more volume of wine, it is about the natural process and care of making wine. Buehler also does no irrigate. It is completely up to the weather to make the vines work or not work. Thank goodness, 2006 was much like 2005 in weather and harvest time. Harvest was pushed late into the end of 2006. Buehler's thoughts about selling his wine is that he believes that he is fortunate and a wealthy man already with a great wife, great kids, great dogs, great home, and great friends. He believes he is fortunate to have his farm in Napa. He wants to make a living at making wine, but he doesn't see the need to grossly over price his wines just to make crazy amounts of profits. He wants to make his wines accessible to as many people as he can, and not just the super wealthy. Even with all the flurry of attention to Buehler's wine in the past couple of years, his Zin is still less than $20. So, a days before, my Burgh friend and I went to the Green Hills Wine Shoppe to look for wines for the week. The Burghs know about Italian and French wines, and in contrast, I know what is white, rose, and red. I know Boone's Farm isn't any of the three. 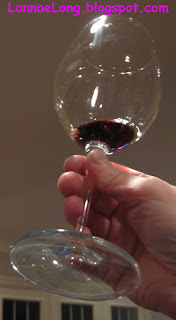 But, I do know that the Buehler Zin is yummo, and a great value, and in full agreement with the Wine Spectator said. I was actually looking for the Buehler Russian River Chard, another great value at less than $15, when I came across 3 cases of the Buehler Zin, and right there and then, I had to get a case of Zin, and with a case I got a discount too! Whee! While the Burghs were visiting us here in TN, they brought their own organic home grown Zebra Striped heirloom tomatoes, and we had our own organic locally grown and raised foods. With a fridge overflowing, we joined forces and built a meal for ourselves. We also served our 2004 Merlot, which I did not photograph. In non-formal settings, I must admit, we have gotten a bit lazy about labeling our wines. It has come down to blue painters tape with a sharpie marker label on each bottle to let us know what varietal and vintage. But really, the question is, is it the label or is it the contents of the bottle? So, anyway, on to the "pick up meal". It was like a pick up basketball game at the park. We all were in the kitchen bringing out our own ingredients, and we just tossed together this 5 dish meal. In my mind, my perfect kitchen would be like this all the time. No matter who came over, they would feel comfortable to look in the pantry and fridge, and start cooking with what ever pots and pans we have. I like it when it is a group dinner prep thing. I really dislike it when there are people just sitting in the living room waiting for dinner to be served. Now the question is, how do I get the Burghs to move to Nashville, and have them live on my street so we can have potluck dinners every night? Anyone? Any suggestions to make that happen? 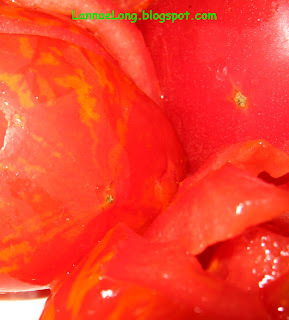 So it was great, the Burghs brought their tomatoes. One of the Burghs saw that I had a withering basil plant out back so he went ahead and took the all the basil leaves to sprinkle on top of the sliced tomatoes. I had some cheap shredded parm and excellent olive oil to drizzle on top, and the Burghs made a great opening dish for our meal. I appreciate the Burghs so much for scanning thee food landscape, and finding my potted herbs on the back porch. 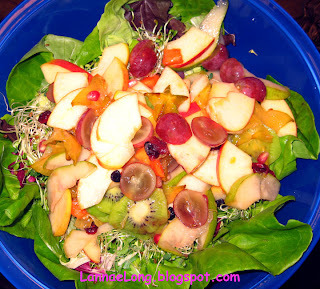 It was so wonderful for me to have one dish down, and not lift a finger to get it done. 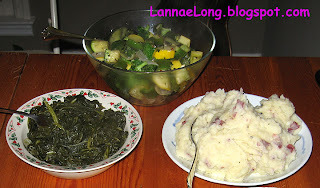 Of the 3 side dishes, we made the turnips greens and smoked summer veggies, and the Burghs made the mashed red potatoes. The greens were from the tops of the local turnips that I cooked later. I made the greens with traditional southern flavors by first cooking a couple strips of Scott's Bacon, a great local country bacon and ham maker about 80 miles north of me, then adding the greens and a couple grinds of pepper, and then letting the greens cook down to a manageable volume. I started with a sink full of greens, and as you can see from the photo, I only got one bowl full. The mixed smoked veggies were green and yellow zukes, broccoli, purple and green sweet peppers, and other herbs from my back yard like oregano and thyme. 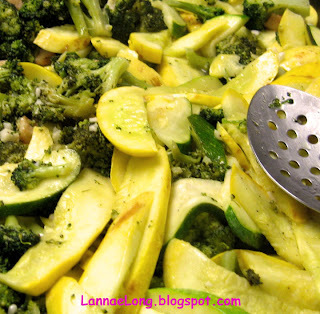 All of the diced veggies went into a grill safe pan with some olive oil, salt and pepper. I particularly like this dish a lot because I prep the ingredients, and someone else cooks the ingredients on the grill, and I like the smoky flavor. 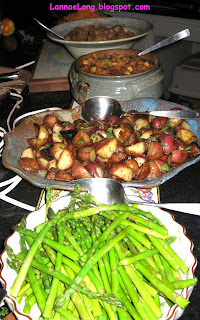 This variety of smoked veggies were cooked over hickory wood. Again, the smoked veggies are a hit, and people love them. This has been a fool proof way of getting everyone from teenagers to adults to eat their veggies. 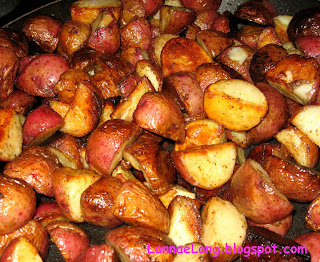 The last side dish was the potatoes made by the Burghs. This was completely done in the microwave! This is the 1st microwave I have had, only because it was built into the house. I never wanted a microwave before because I believed in the more traditional ways of cooking and re-heating with the stove top and oven. I was blown away with what they did with the potatoes. They nuked the potatoes until they were done, then set them aside. They then warmed up some of my Hatcher Dairy milk and cream, butter and other pixie dust stuff in a microwave safe cup in the microwave. Then they put the potatoes and warm milk mix in a pot, and potato mashed them together to make the perfect rustic mashed potato dish that never got stiff or soupy. I guess I am now truly converted to using a microwave now. 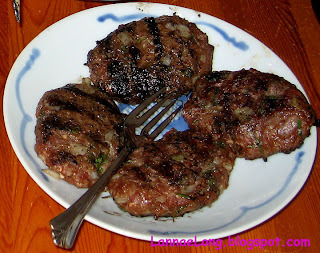 The last dish I made was using ground lamb I got from DW Farms. DW supplies meats to a couple of restaurants in town, and usually when I want a cut of meat, they tell me that Jeremy just took the last piece. They always say that I need to call or email them in advance they will hold back a cut for me. Well, I am not that organized, and most meals are on made on the fly with ingredients that I see that day. So as it goes with DW Farms, what I could get was ground lamb. I made a version of kubideh for my guests. I took the lamb, and mixed it with a dash of baking soda, salt, pepper, onions, garlic and fresh oregano from my garden. I massaged all these tasty bits together, and then Matt put these little kubidehs on the grill to cook them. They were tasty. I think that I need to get some dried sumach to sprinkle on the kubideh to make it taste better. So as it was that evening, all 4 of us participated in making the meal in some way shape or form. This is my ultimate home kitchen experience. I would love to have this way of cooking and dining again. Burghs, don't be strangers, come back soon. The next day, after our visit to the Jack Daniel's Distillary, we were driving back to the Franklin's house. We stopped into the Wild Oats, now owned by Whole Foods, and got a few munchies and snacks for dinner. I was not yet hungry after the huge lunch and fried okra I ate, but I played along. We started with 4 cheeses. We got a lemon stilton, a cheddar, a hard Italian, and a horseradish aged cheddar. The funny one was the lemon stilton. For me it was a love hate. The bits of lemon mixing with the creamy stilton was nothing like I have ever had. 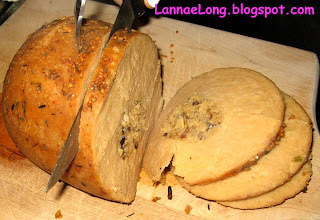 The aroma was a stilton lemon pledge scent that grew on me. I actually tried the horseradish one first, which has been a strongly flavored favorite of mine for snack. That was a good thing that I did. After I tried the lemon stilton, that about over powered the all the cheeses including the horseradish one. is the wine. Here is the story. The Franklin guy went on his 1st and only trip to Sanoma in 1990. He found himself at the Oakville Robert Mondavi vineyard, and he bought his first bottle of wine. 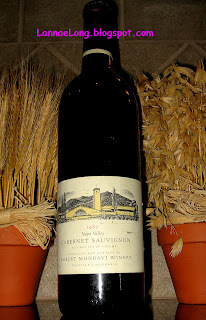 It was a Robert Mondavi (before Robert Mondavi went all wrong) Oakville Cabernet, 1987 that was just released in 1990. That was back in the day when you could still bring bottles of all you want in the cabin of a plane, and drink up on the plane if you wanted. Anyway, he brought the bottle back to a dorm, various apartments, and even had carelessly left the bottle on a radiator all winter. There was a 5 year period when he had the bottle boxed up in the earthen basement and completely forgotten about. As the Franklins moved to my fair state of TN last year, he found his bottle that he has been toting around this country, from West to East, and from North to South. When and where to drink this bottle he asked. Well, with his best friend from college visiting, and let me tell you the Burghs are quite the wine experts, he thought it was the time to enjoy his bottle. As any wine maker will tell you, wine will do you no good in the bottle. It must be enjoyed. I believe he enjoyed his time with his dear old friend, and this was the day for this 20 year old bottle. So we popped it open. The cork looked great! The resistance on the cork seemed like a good seal. There was no evidence of mold. The color, it was a deep garnet red that the photo could do no justice. The aroma was fruity, villiani, and a hint of cedar. The aroma, I just could not get over how lovely it was. The tannins were so mellow, that it was like velvet on my tongue. The wine was well integrated and basically the bottle was poured at the right time. Anytime before, such as in the 1990s would have been to early. 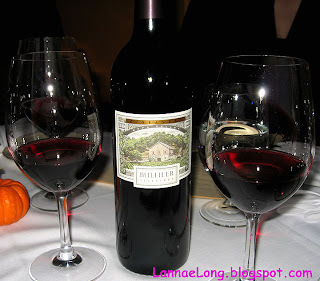 What a fantastic bottle of Mondavi Oakville we had that evening. The Burghs were chiding that we were probably the only people in the wide world to be drinking an Oakville Mondavi Cab, and not have it be a bottle labeled as a Reserve. 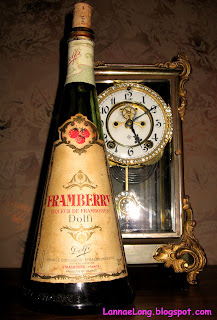 So, to satisfy my curiosity, I did poke around the internet to see if there was any bottle like this left, and as the Burghs said, there was none to be seen on the first 5 pages of a google search. I am so honored to have been a part of this lovely truly unique uncorking experience. After we cleaned up our dishes, and washed away the last residual in each wine glass, I felt a bit sad that the 1987 Oakville Cab ride was over. The Burghs looked at me and Franklin with big grins, and said, "Ah, but there is always another bottle to experience and share!" Ah, then I smiled and I started thinking about the next bottle. While the Pittsburgh friends were visiting, we wanted to take them on a touristy tour that would show what Tennessee is all about. We went to Lynchburg, TN to get a tour of the Jack Daniel's Distillery, and to dine for lunch at Miss Mary Bobo's Boarding house. This historic home has only 2 seatings, 11 am and 1 pm, and it is by reservation only. This day, we shared our table with a Rotary Club and the Red Hat Ladies, and Miss Mary Bobo's seated 82 for lunch at this time, but has capacity for 120 per seating. The boarding house has been in service for about 99 years, and was a bed and breakfast before the bed and breakfast became shee-shee with the yuppies. In its day, there were long time renters, a school teacher and a banker, and then the wayward guests who came and went through the fine town of Lynchburg, TN. Miss Mary Bobo ran the boarding house until she died in 1983. With some wheeling and dealing, and some relatives and people weighing in on preserving the history of Miss Mary Bobo's, Jack Daniel's Distillery purchased the property, and kept it open as a historic lunch place, and discontinued the rooming part of the business. The Franklin Friends made the lunch reservation for 1 pm. 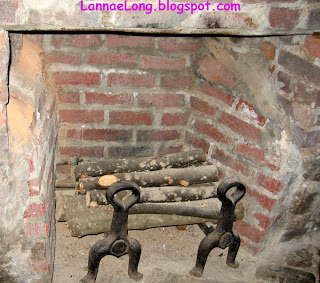 We got lucky, and were seated in the original section of the house in the rear. In olden southern times, plantation homes had a house, and then a separate building out back that had a kitchen, dining room, and slave quarters, and this building has been preserved. We had our lunch in the original kitchen, as the new industrial kitchen has been built on recently. Our dining room was across the way from the hand dug well, which is gated now, and tourists can see it and get a feel for what it was like to cook and get water way back when. We shared our table with our hostess, and a 6 other strangers. We talked to them, and it turns out a couple were there for a birthday lunch, another was from MA, and yet another was from FL. We had our Burgh friends, so we came from all over. 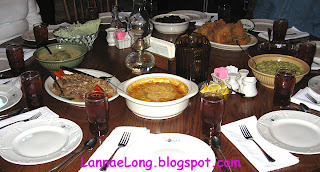 On the family style menu this day was fried chicken, beef stew, cabbage casserole, corn, lima beans, fried okra, chow chow spicy tomato and onion relish, cooked apples with Jack Daniel's and sugar, corn muffins, and French coconut pie with whipped cream made with a little Jack Daniel's. Lynchburg is in a dry county, so only iced tea, water and coffee were served with lunch. Sorry, no sips of the good stuff. The meal was traditional southern, showcasing ingredients that grow in the south. The fried chicken was deep fried to accommodate the shear number of diners at lunch, but the original recipe calls for southern skillet fried chicken. If we had the traditional skillet chicken, we would be there for days because it is time intensive. The meal, honestly, was ok, but the tradition, and the southern formality was what I was eating up. I just love the history of food. One dish that I really like was the fried okra. It has a nice light, almost a thin tampura batter on it. 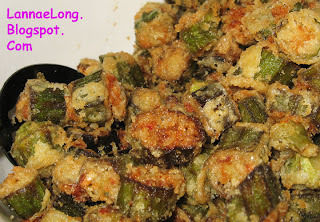 The okra was not slimy, and the fried parts were crunchy. I have never liked fried okra until now. I ate 2 plates full of okra. Yeah, I waddled out of Miss Mary Bobo's with my big tummy after that. I ate part of the French coconut pie. It seems that everyone at the table enjoyed the pie. I personally don't eat much pie because they are usually too sweet for my taste, as was this one. 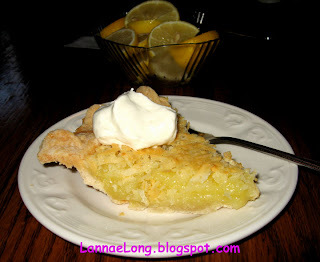 The crust, however, was completely eaten because it was a homemade crust with a light flaky texture. It was fantastic. The coconut shreds in the pie were also good. I think Jack Daniel's has done a fine job preserving the illusion of old Southern charm in Miss Mary Bobo's Boarding House. Come for the tradition and the southern history, and enjoy breaking corn muffins with other travelers to this quaint home. There is a set of friends from back "home" that moved to Franklin, TN last year, and the four of us are friends from college. The 4 of us are meat eaters. We have another set of friends who moved to Pittsburgh, and we had a nice week long visit from the 'Burghs. The Burghs are foodies and winos, and 1/2 the fun they have is creating great dishes. Most of the time, one is nearly vegan (she eats honey), and the other is a lacto veggie, but when they are on vacation they eat some meat. Most of the time, the food they make is so good, you don't miss the meat, so we were totally happy to have them cook with us. On opening day, we were all going to do a pot luck dinner, and the Burghs were going to wine pair, and we were going take all the food down to the Franklin McMansion so we could spread out. Just about time we were ready to roll to Franklin, the tornado warnings were kicking in, and we decided to stay in town and not go the 17 miles. As luck would have it, the Franklins were just getting off work and got stuck in the traffic, so they popped over to our tiny little city house near their work, and for them to get out of the rain. It all worked out in the end. 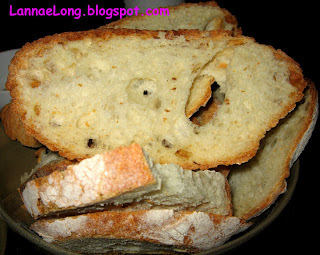 We started with an olive oil tasting and Provence Bread. I order all my olive oil from the Olive Press because they are all California grown, organic olives that are truly 1st cold pressed to make the olive oil. The flavor of these oils are so intense, that you only need a little of it. I set out an Italian blend, Arbequina Spanish, and a lemon and olive pressed oil. It was fun to show case the oil. The Burghs said that most Italian oils sent to the USA are blended with tasteless oil and are not tasty. They were totally impressed with the Italian Blend I got because it is full on olive oil, and there is no blending. The Spanish olive oil imported in th is country is less likely to be blended with cheap tasteless oil, so that is why Spanish oils are flavorful. The Arbequina varietal is spicy, woody and aromatic, so a little goes a long way. The 2nd and 3rd courses included smoked summer veggies and truffled mac and cheese. These 2 dishes were made with mostly local ingredients. 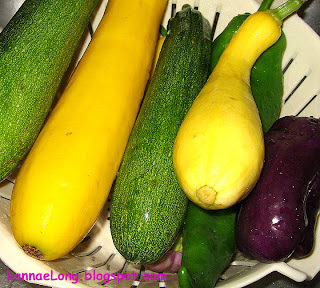 The veggies included zucchini, yellow zucchini, broccoli, summer squash, red sweet peppers, poblanos, onions, garlic, cayenne pepper and thyme and oregano from my garden. All of these ingredients were grown local organically. I diced them all up, and stirred in some salt, pepper, olive and truffle oil. 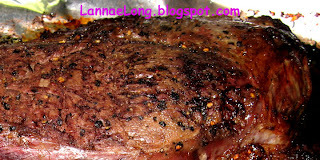 All of the ingredients are plopped in a grill safe pan, and put over hickory and a little mesquite wood until tender. People love this dish. Yes, people seem to love eating smoked and truffled veggies. The light veggie dish was paired with a heavy truffled mac and cheese. Here is the recipe that was given to me by the Capitol Grille: 5 cups pasta, 2T white aged cheddar, 2 T yellow cheddar, 1/2 cup heavy cream, and a few drops of truffle oil and salt and pepper. My artistic license included a 1/2 cup aged cheddar from the local producer Kenny, 3/4 cup cream from Hatcher Dairy, a 60 cow local dairy, a crushed clove of garlic, salt and pepper, and about 2 T of truffle oil. The truffle flavor is not as intense as the Capitol Grille, but it served its purpose for a tornado ridden evening. The 4 dish was the Burghs dish beans and greens. They just got a 2 cans of mixed beans, rinsed and dried, and dumped them into a heavy pot with about 1/4" of olive oil in the bottom. It was kind of like frying the beans until parts the outsides were crunchy. They added sliced garlic into the pot, and the the garlic bits get fried and crunchy. Then after about 30 minutes, they added the washed and shredded green chard, but kale, Swiss chard, turnip greens, beet greens, etc would work too. They just left the beans and greens going on low until it was ready to serve (about 1.5 hrs after they started cooking). The Burghs said that this beans and greens dish was a real staple main dish in the USA before the 1950s, and before we became a beef and milk eating country. The beans and greens are a good source of fiber and protein, and it really got our meal back to the basics of American eating. 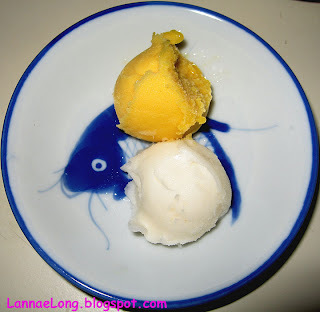 As a palate cleanser before moving on, we served lemon and mango sorbet. I finally got a use for this tiny ice cream scoop the size of a melon baller. I bought that darn thing from the Pampered Chef because it was cheap and cute. It comes and it is a right handed scooper, and I am left handed. It is kind of a bother, but I managed to fudge through while scooping these refreshing blobs onto our little dishes with blue fish on them. I was excited to use the blue fish because it means a wish of good luck and prosperity to those whom I serve the dishes to. For our 5th course, we made a whole beef tenderloin in the manner of Alton Brown. About 15 minutes on the highest setting in the oven, then turn down the heat to 200F until the internal temp is where you want it for doneness. I wanted a rare roast, so I looked for 135F internal temp. Since this was a toss together meal, I did not get to age the beef, but it was ok. The Burghs made a Pasia sauce with roasted garlic and honey. The dish was a hit. The ends were well done for the midwest gal who likes her meat dead, and the middle was quite rare for people like me who still like a cold center. What did I drink with that beef? I bought a bottle of Brother Timothy a couple years ago from Mrs Newton, the Newton Winery Winemaker. Mrs Newton is not only one of Napa's oldest vineyard's winemaker, and vineyard owner, she is also a retired doctor who practiced in downtown San Francisco. She is Chinese, from an area called Toysan, in southern China. It is the same region where 1/2 my family is from. Her town was poor and rural, and she had no future there except to be a peasant. After WWII, and the crackdown in China to communist rule, Brother Timothy and his foundation were able to bring some bright children out of Southern China to attend school in the USA at no charge to the children. Mrs Newton was one lucky child. She excelled and was so intent on learning, she learned so much all they way to becoming a doctor. She loved Brother Timothy and the foundation who gave her a chance for an education, that she has always looked for ways to give back. After she met her husband and became a Master Winemaker, she started calling in her vineyard friends all up and down the valley to help her support Brother Timothy and the education foundation. She was able to go and hand pick cabernet grapes from all the greats including Newton, Mondavi, Hess, Opus One and others to make the Brother Timothy 2001 vintage. Now, each year, the participating winemakers rotate who makes the wine, with 100% of the sales price going to the the Brother Timothy LaSallian Education Fund. The wine was well integrated, and we enjoyed it with our beef course. Wine must be enjoyed. It can't do anything for you while it just sits in the bottle. So, as the course went on, and as the wine oxidized, the fruit and oak blend to make a different wine from when the bottle first opened. The aroma, well as one said at the table, we would be happy to have a fragrance made from the wine aroma. Any woman's fragrance maker out there, read up, we want a wine aroma for a perfume! 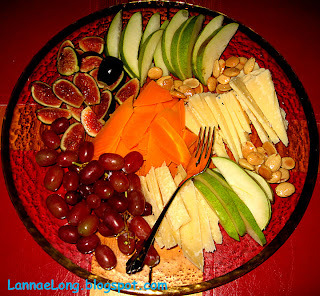 Our 6th and last course, if all the rest was not enough, we had a cheese and fruit plate. We went traditional with pear, grapes and figs as our friuts. 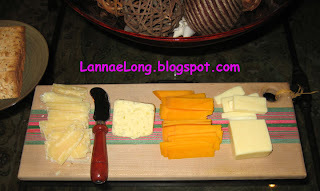 We had a mimolette, manchego and a reggiano for our cheese. Because I wanted to be gluttonous, Burghs got me Marcona Almonds and we had those too. Someone mentioned that this was a civilized dinner, but I think it was the 1st over the top dinner I have ever served at my house. I don't think I have ever served sorbet as an intermediate for the meal, and I don't think I have ever had 4 different wines with a meal in my house either. What did we drink? Well, good thing most of us were not driving, only one was, and she only had one sip of each. We started our bread course with a Grande Rose Champagne from the Rhine region. It was smooth, on the sweeter side, and a nice refreshing start to our meal. We had an Italian wine Piano Di Montevergine Taurasi, made by Feudi di San Gregorio, that was able to stand up to the smoke of the veggies, the truffled of the mac and cheese, and the garlic of the beans and greens. All three of these dishes had it is own strong flavor and this Italian because a hero while we dined. We had my Brother Timothy withe the beef course. We then finished our meal with a sweet dessert wine that paired will with the pear and figs. The Italian Muscat wine, moscato d'asti, was a surprise to me. I did not originally know it was a dessert wine. While I was clearing the table, someone poured a bit for me, and I took a sip, after moving from the Brother Timothy cab. I was taken by surprise! 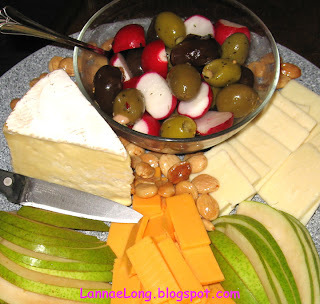 Once I realized that it was a dessert wine, and got to nibble on some fruit and cheese, I had come to love the moscato. It was a sweet way to end our meal. Stay tuned for more to come. I live inland. My state is landlocked by 7 other states. There is no salt water near me besides the pasta water on my stove. So, it has been a long time since I have dealt with a whole salt water fish. On this day, I picked up a whole red snapper from Gulf Pride seafood. It cost less than $7 per lb for the whole fish, and nearly $15 per lb for it filleted. Let me do the math, I opted to take home a scaled whole fish, and use the fish bones for a stock. Why would I want to pay more for fish when I don't get to take home to bones? 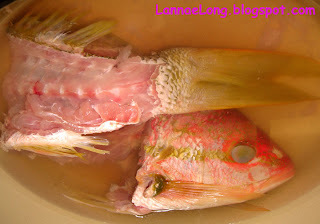 I filleted my red snapper, not very well, by myself. Note to self, sharpen the knife before starting a fillet. It looks so easy on Iron Chef, and Top Chef. It has been 10 years since I have lived coastal and filleted a fish, so it was a bit awkward. About 1/2 way through the fillet of side one, I finally understood why the filleted fish cost over twice as much. Oh well. I had two unattractive fillets of red snapper that I made into the Nobu Miso Cod Style. I marinated the red snapper fillets in white wine, miso, mirin, sesame oil, and honey, then popped under the broiler for a little carmelization. Delicious. I love the simple combination of flavors of the Nobu Cod because it is so effective. I did use some artistic licensing, and used what I had on hand to make the marinade, so I substituted a little Napa chardonnay instead of sake, and I used toasted sesame oil because I love that flavor. It worked for me. The fish bones, and residual fish on the bones, I made into fish stock. I did not have celery or carrots, but I had onion, flat leaf parsley and thyme for the stock. I added a couple pepper corns, and a dash of salt, and not too long after a boil then a simmer, there was a big Dutch oven full of fragrant fish stock. I could not believe how much flavor was given by this fish. I used all parts of the fish, and the fish had nothing left to give. I had about 8 cups of stock from this venture. Now what? I knew exactly what. I have been looking at KatieZ's Thyme for Cooking and all the different rice dishes she has made, and I decided to make a risotto for the 1s time. 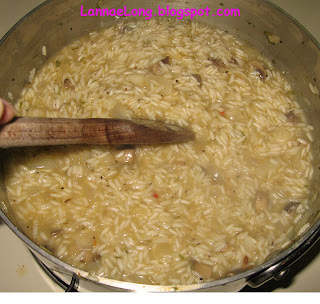 I was lazy this day, and I wanted to use only what I had in the house, and I did not have any Arborio rice. So I had my choice, medium grain brown rice or Jasmine rice. Since I did not want to have to stir for 2 hours with brown rice, I opted for the Jasmine. OK, folks, it is really important to use a sticky and starchy rice like Arborio, or I bet sushi rice might work, but the average American Carolina rice is designed to not gum up and doesn't lend itself to a risotto. BUT, my pseudo risotto tasted pretty good, but with a rice porridge texture instead. I added onions, mushrooms, garlic, red chili peppers, salt, and thyme and started stirring and stirring and stirring in my fish stock a little at a time. After about 25 minutes of the stirring, I gave up knowing that I needed a gluttonous rice. It was a great experiment, and after sprinkling on a little parm cheese, I got a tasty side dish to my fish fillets. Sometimes lazy substitutions don't work out, but this one kind of did. The texture wasn't risotto, but at least it tasted great! I went to the Day of the Dead - Dia de los Muertos celebration at Cheekwood Gardens. It was a small celebration of saints (November 1 is All Saints Day) and souls (November 2 is All Souls Day) that have come before us. As with any celebration there is always a tradition of food. We got the celebration, and saw a local bakery selling backed goods and sugar skulls. 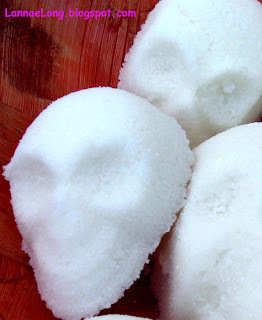 Sweet candy skulls could be made with chocolate too, and many times they are decorated in bright colored royal frosting. 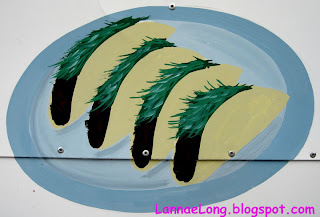 There was also a taco truck with the promise of tacos that look like this painting. This painting looks more like brown stuff covered in grass or grassy moss. 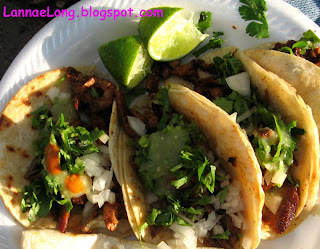 I found that my curiosity was piqued, and wanted to know what their tacos really looked like. To my happiness, the tacos were not covered in grass or grassy moss, but they were covered in onions, cilantro, and some green chili sauce. We squirted a little lime juice on top, and chowed down. As per usual, taco truck tacos are always good, and these little tacos were tasty and made a nice snack for us. We went on our way to check out the gardens, the scarecrows, the art, and the Day of the Dead pet cemetery. The kids got to draw colorful headstones for their pets that have past on. Check out the cat's blog to see some of the headstones of honored and celebrated pets. During the Day of the Dead Celebration, it was nice to think about all the goodness from those who came before me.